As far as you can say this about any four-time NBA champion with a 14-year career, Manu Ginobili is defined by international basketball. He first stepped onto the world stage when he led Argentina in scoring as they handed Team USA a loss at the 2002 World Championships, the very first loss for Team USA with NBA players. And after his sophomore NBA season, he was the star of the Argentinian squad that won gold at the 2004 Olympics, the only non-American team to win since 1988. 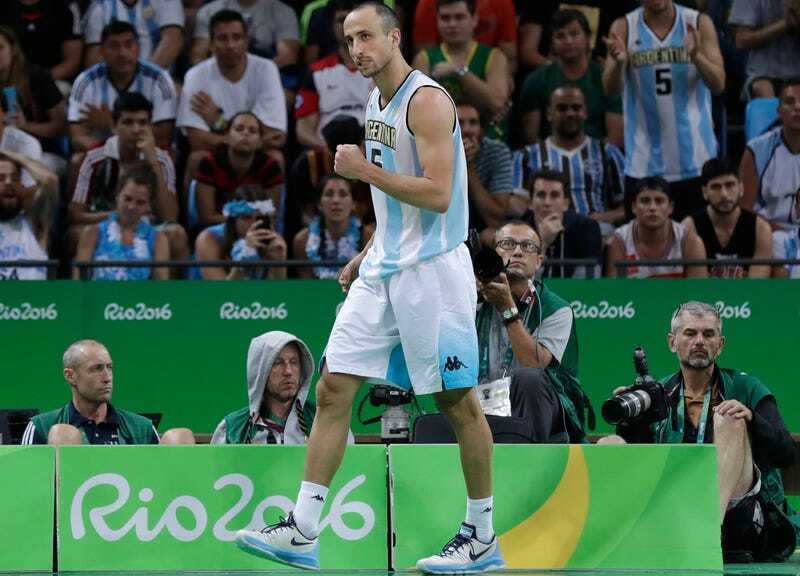 Ginobili is coming back for a 15th NBA season, but at age 39 he is currently playing in his fourth and surely final Olympics. Along with Luis Scola, Andrés Nocioni, and Carlos Delfino, the Argentinian Golden Generation is making one last run. So far they sit atop Group B with a 2-0 record, and with Spain having already lost twice, Argentina has a good shot at facing the United States in the gold medal match. Ginobili, along with other standouts from the NBA’s second wave of foreign players—Dirk Nowitzki, Tony Parker, Pau Gasol, Yao Ming, others—immeasurably changed the NBA. But Ginobili specifically, with his Euro step, whipped wraparound passes, creativity at the hoop, and swashbuckling defense, injected more creativity and beauty into basketball than almost anybody else. He’s no Kobe Bryant or Kevin Garnett, but especially given his mixed European-South American heritage, it’s not crazy to think that Ginobili’s impact on world basketball is just as great. All of this is a prelude to saying that you should try and catch an Argentina game or two at these Olympics—they have a potentially scintillating match against Lithuania that kicks off at 9:30 p.m. ET tonight—and read every word of this fantastic Zach Lowe story on Ginobili’s career, the bonds he forged with Argentinian and Spurs teammates, his battles with Gregg Popovich, his quirky interests, and his insatiable drive to win. He staged little rebellions every night. The veterans cackled at them. Whenever Ginobili would do something crazy, Willis, Kerr and Danny Ferry, the graybeard benchwarmers, would scream in unison: “He’s a bad man!” During one pregame film session, Popovich showed a clip of Ginobili heaving a high-risk, fast-break pass out of bounds and told him never to try it again, players recall. The very next game, he got the ball in a similar situation, wound up for a pass, pulled the ball back and paused to grin at Popovich. The bench went nuts. Ginobili carried no sense of entitlement; he outworked everyone in practice, especially during scrimmages, when he played as if it were Game 7 of the NBA Finals. Toward the end of an early September 2007 pickup game involving Spurs and visiting free agents, Ginobili dove through three players to retrieve a loose ball and flung it to a teammate. That player scored, and Popovich, watching, stopped the scrimmage even though it wasn’t over. Manu Ginobili is wonderful, and when he’s done playing—which could be as soon as 10 months from now—basketball will be much worse off for it. Appreciate him now while you can.